Most people who know me well will say I am a good home cook and was a good parent to my three sons (no comments, boys), but I have had no luck with plants, whether indoors or outdoors. And it isn’t for wont of trying. I dutifully planted pallets of colorful pansies, poppies and many other varieties of flowers every spring, only to have them all die. I had similarly bad “luck” with my attempts at growing house plants, even managing to kill numerous cacti. One time, from a high-end mail-order garden company, I ordered a monthly flower which was to be delivered in a ready to bloom, but I managed to kill every one of them. Most never even bloomed. They were guaranteed, but I doubted the company would believe that not one had survived. So when I moved to Spain, I decided I would take another stab (perhaps the wrong word) at growing plants. 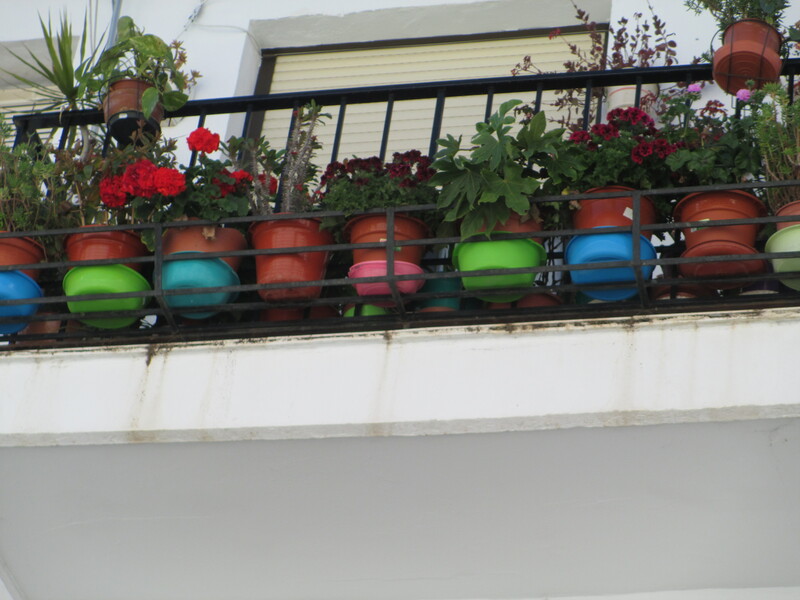 The windows of my “piso” (apartment) and many homes here have large marble ledges covered by black ornamental grates where people often put plants. I also have a long, narrow outdoor patio, and people here often hang plants from the metal fence enclosure. The verdant displays of plants and the colorful cascading flowers were inspiring. After buying supplies for my new apartment, I had been given two free plants from a local sundry store. Since the plants were still alive after a month, I bought some potting soil, a single hanging wire basket for my balcony railing and a plastic pot in which to put one plant and the other to go in the pot on my windowsill. I was not going to invest the time and money to buy the long plant holders, which hold multiple plants until I had some success. Mother Nature smited me by sending howling wind and rain the night after I had planted and hung the balcony. When I went the next morning to hang my laundry (more about that challenge in a moment), my poor little plant was uprooted, laying on its side after all the soil in which it was buried blew all over my porch and the street and cars below my second floor balcony. I did repot it, but the dirt is still evident on its leaves as I fear touching the plant any more than absolutely necessary. Now on to the unexpected laundry challenges. 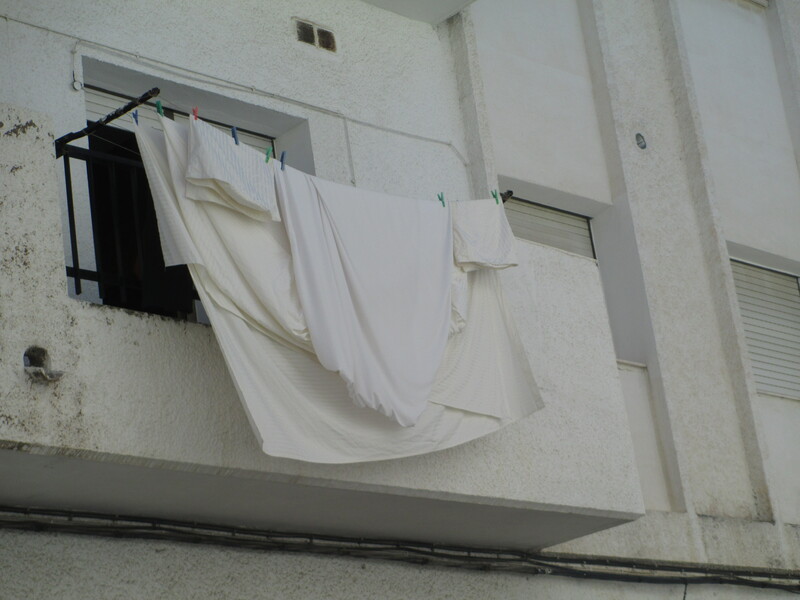 When I first arrived in Spain, I learned that few people have dryers, and instead hang their laundry either on lines off their balconies or windows, or on a standing metal folding stand which can be opened to hang laundry indoors or on the street outside one’s first floor dwelling. Wash machines are typically in the kitchen, but I scored and have mine in a small separate utility room. Before getting my apartment, I rented several vacation apartments, so I have had the opportunity, if you can call it that, to use a variety of wash machines; they are all small and take an incredibly long-time to complete a wash cycle, two to three hours. Nonetheless, the first couple of times I did laundry, I found hanging the laundry on the portable metal stand quaint, reminiscent of a simpler time. I remembered the heady fresh smell of sheets I had once hung outside to dry when I was a teen-ager and was looking forward to revisit that experience. The first couple of times went well, just enough to lull me into complacency and cause me to fail to anticipate the problems that could and did arise, or should I say fall. In fact, at first the laundry seemed to dry quicker outside than in a mechanical dryer. The small “sidewalk” to the right of the plant was where I had to put the laundry stand to dry my clothes in my first apartment. 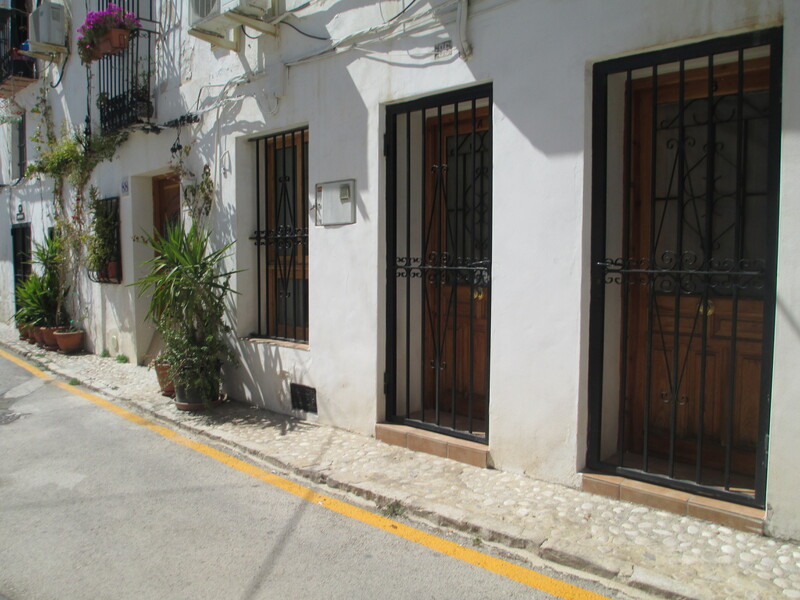 My first vacation rental was on the first floor on a busy street, so the laundry rack was placed on the incredibly narrow uneven, cobblestone “sidewalk.” Both the uneven surface and wind, on different days, were the culprits in the toppling of my laundry. Wet clothes laying on a street where there are many cars, pedestrians and dogs does not bode well for having clean clothes. When I got my own apartment, there was both a metal laundry rack on the patio and laundry lines hanging off my balcony, both rusted. We are on the Mediterranean, after all. I purchased a small roll of metal line covered with plastic that looked perfect for the job of stringing new clothesline. The seemingly simple task of changing the laundry line was anything but. I had difficulty getting the old rusted line off, and sadly, it took me hours just to string the five new clotheslines. I should have paid more attention in Boy Scouts as to how to tie a secure knot. Wait, I wasn’t in Boy Scouts. Maybe that was my problem. Long story short, I inconsistently strung up each one trying to make them as taunt as possible, but ultimately was only marginally successful. But I was proud that I had accomplished that task. I soon found out there were other unanticipated laundry challenges, such as getting used to your underwear hanging outside for everyone to see, wind blowing your laundry off the line on the street below, unexpected rain saturating your clothes, and trying to accurately predict how long it would take to complete a wash cycle (it seems variable) so as to get the clothes hung before leaving, and anticipating how long would be needed to get things dry before night. On one occasion, the sheets were on the line when the weather suddenly turned foul, causing me to quickly bring them inside and try to dry them in front of a small space heater. At close to midnight, they were dry so I could make the bed. I felt a small sense of success over Mother Nature who, since I sold my car can no longer rain on it, instead seems to make it rain every time I hang laundry out to dry.